Whether it's for games across the county, tours of Africa with Bono or trips to Ibiza with Gisele, Tom Brady logs a lot of time in the sky. We're not sure if dating a supermodel has upped his style game, but seeing this shot of Brady and his lady (minutes after landing at LAX), proves the guy knows how to travel in style. Here's some suggestions on how to cop the QB's off-the-field look. You're now free to roam about the page. We're not totally sold on the hat, but if you're on a long flight, you'll want to sleep. And with sleep, comes the telltale bed head, so a coverup may not be such a bad idea. D&G by Dolce & Gabbana cadet cap, $95 at Saks Fifth Avenue. Flying? A well-made pair of aviators is in order. They'll shade you from the sun's glare while you're trying to sleep and send a signal to your seat-mate that you're not looking to chat. Ray-Ban aviators, $160 ($125 at Amazon ). Grab a lightweight scarf in a neutral color and never cease to be amazed at its handiness--opened as a cover up for your girl, balled up for a pillow or protecting a fragile souvenir like bubble wrap. Oh, and it can keep you warm too. Cotton scarf, $22 at ASOS.com. Simple enough to wear with a tee and jeans or refined enough to layer under a blazer, the half-zip may be the only sweater you'll need to pack. This cotton and cashmere version is a little lighter--perfect for year-round wear. Sweater, $85, at J.Crew. Ditch the sloppy sweats. Tom sports a pair of twill chinos in a classic denim cut--lighter than a pair of jeans and just dressed up enough to go from the gate to dinner. Five-pocket kahkis, $36 by Dockers. You can't see Tom's shoes here, but we'd suggest Converse slip-on Chucks. They're our choice of flying footwear. Classic style, easy on-and-off at security, light and breathable. Converse All Stars, $47 at Zappos . You should be well dressed. Your luggage need not to be. Grab a durable duffle or carry-on in ballistic nylon. Weekend bag, $168 at Banana Republic. 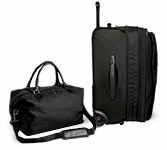 Alpha suitcase, $595 at Tumi. 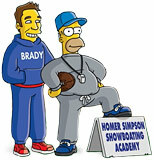 Tom Brady voiced an animated cameo appearance in a 2005 episode of The Simpsons. 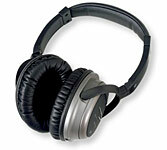 Solitude's set of noise-canceling headphones is one of the best-reviewed, most affordable on the market and comes complete with an adapter for the airplane's sound system. $200 at L.L. Bean.